Although the war is over and her husband did not come home, Jo Manders does not feel closure. Her husband was shot down in Germany but as no body was ever found, he is listed as missing in action and she cannot truly view herself as a widow. With no benefits and limited job prospects in 1921 England, Jo is forced to sell her belongings and become a lady’s companion to Dottie Forsyth, Alex’s husband’s wealthy but patronizing aunt. Jo travels with Dottie through Europe as she meticulously and ruthlessly purchases art. Although dealing with Dottie is a challenge, Jo finds her days busy and numbing. When Dottie announces that they will be traveling to the family estate of Wych Elm House in Sussex, Jo is filled with apprehension and sadness as she returns to English soil. Life at Wych Elm House provides Jo with a very different view of her husband’s family. She meets Dottie’s husband Robert; whose existence Jo was unaware. He is both flirty and distant, harsh and unemotional. Also newly arrived at the house is Dottie’s son Martin, who was injured in the war and still deals with both emotional and physical pain. There is yet another inhabitant of the house, although Jo is the only one who can see Francis, Dottie’s dead daughter. Alternating between sanity and madness, Francis had always been a difficult child. She claimed to be frightened of the creatures who came through the door. The people of the surrounding estates and towns were afraid of Francis and now claim that her ghost haunts the woods. She committed suicide by jumping off the roof and a darkness has since spread throughout the house. Jo finds her belongings moved and leaves appearing inside the house; when she sees Francis, she becomes afraid that the madness has crept into her own psyche. Soon Jo realizes that Francis is asking for her help and Jo must delve into the family’s secrets. What she discovers about her own husband shocks her and she questions whether she truly knew him. Time is running out however as Francis’ ghost becomes more active and Jo fears for her sanity and her life. She just isn’t sure who she should be afraid of – the dead or the living. This is the fifth book by Simone St. James and they just keep getting better! Set in the same time period as her previous novels, St. James explores the generation following World War 1. Those who come home are dealing with physical pain and mental horror, but I find the characters who were left behind equally compelling. There is a sense of desperation about Jo and the loss of her husband. Her own background is fraught with sorrow and loss, and I just wanted the poor woman to get a break! Her strength of character is admirable and there is a sense of compulsion and desperation in her fight for any sense of peace. St. James also incorporates some fascinating details about how the Sussex coast could have played a part in the war. This plot detail really brings the story together and gives depth beyond a paranormal romance story. Even if a reader isn’t into “ghosts,” you can really appreciate the gothic atmosphere and rich details of the plot. I don’t think fans of St. James will be disappointed with the story. The protagonist is a widow, which is a departure from her previous stories, but the character is very appealing and heartfelt. Fans of a good suspense story should definitely check out this author. As I have previously mentioned, I shied away from her books because I am not a fan of horror stories and the back cover plot descriptions turned me off. This couldn’t be more from the truth; the fast-paced, atmospheric story really kept me engaged and fascinated. 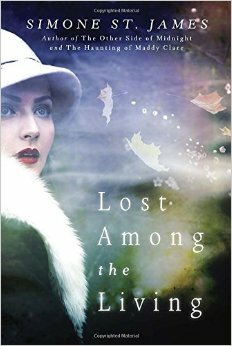 This entry was posted in Individual Books and tagged ghosts, gothic story, Lost Among the Living, simone st. james, Sussex, World War I on April 11, 2016 by kvgaughan.